It’s flu season. I just finished nursing my husband back to health from a rather nasty version of the bug that had him laid out for three full days. During that time, he and I subsisted almost exclusively on this vegetable broth. It’s nutritious, warming and comforting, and it also happens to be delicious. I developed this recipe after he had some minor surgery a couple of years ago. I wanted with all my heart and soul to help him heal and felt almost guided by some higher wisdom in my choice of ingredients, which is why I call it my “inspired vegetable broth.” Ever since then, it’s been my go-to recipe when he gets sick and it’s the one he always asks for. It makes my heart happy to think I can cook up a meal that comforts him and maybe even speeds up his recovery. This broth has a special ingredient: porcini mushrooms. The recipe is very nice without them, but when these tasty mushrooms are added they lend a whole new dimension and richness to the flavor. The broth can be served alone, or you can serve it with any number of grains. I usually add whole wheat couscous because it goes down easily over a sore throat, but cooked buckwheat, quinoa or even whole wheat pasta, for example, are very valid alternatives. 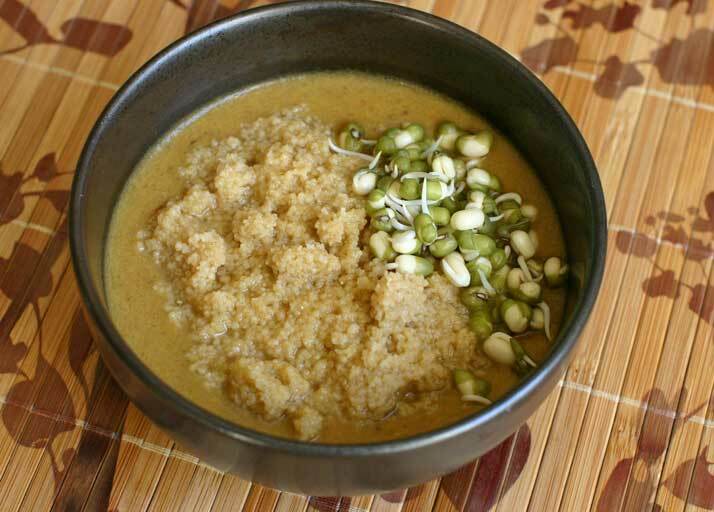 I garnish the dish with homemade mung bean sprouts to add some extra protein and a little crunch to the texture as well. Of course, there’s no reason to wait until someone is unwell to try this recipe. It’s just the perfect meal to brighten any cold winter day. I like to slice and dice the veggies into relatively small pieces. This makes them soften more quickly in the boiling water and increases the surface area of each veggie that is contact with the water, so that more of the flavor is absorbed into the liquid. The number of garlic cloves and celery stalks you use should vary depending on their size; if you have large cloves and stalks then go with 3 of each, and if they’re small, go with 4 (or more, if you happen to be a garlic lover…). And as always, choose organic produce whenever possible and preferably items that are fresh and healthy-looking. The more alive and vibrant your ingredients, the more nutrients they provide. Especially when I’m nursing someone back to health, I will always forego produce of questionable freshness that has been in the fridge for a little while (e.g. bok choy leaves that have begun to brown a little around the edges, or old, dried-out carrots that I might still use in other circumstances) in favor of fresher ones. Dried porcini mushrooms are available at most supermarkets, but if you get them at a standard supermarket like Safeway, they tend to be rather pricey for a half ounce (about two handfuls) of mushrooms. The best deal I’ve come across is to buy an 8-oz. package from Nuts.com. That’s actually quite a lot of mushrooms and they last a long time because they are dried. Kombu (kelp) is rich in important minerals and makes an excellent, flavorful addition to vegetable broth. 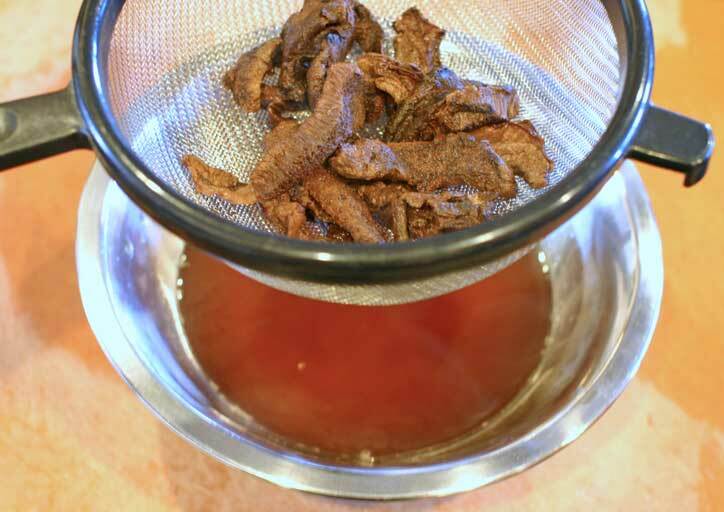 You need to remove the kombu from the pot before you blend the broth to a smooth consistency. I love to eat the boiled kombu with a little of the blended broth on top – it’s delicious – but if sea vegetables aren’t your thing, you can simply discard the cooked piece. I pick mine up at WholeFoods. Try to find unrefined olive oil. For further discussion on this topic, see the inset included with my Pistachio Arugula Pesto recipe. OK, let’s begin. In a large stockpot, warm the olive oil over medium heat. 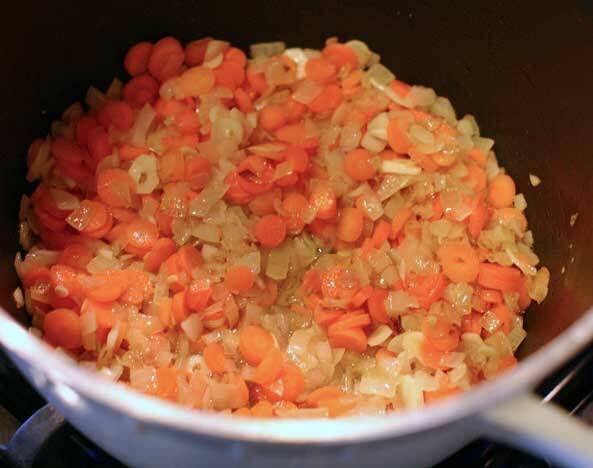 Sauté the onions and carrots until the onions begin to soften, then add the garlic and shallot. Stir occasionally until the edges of the onions and carrots begin to brown. Browning means that their sugars are starting to caramelize, which enhances the flavor of the broth. Add the celery pieces and stir, then add 4 cups of water and bring to a boil. Add the red and yellow pepper and bok choy. Toss in a piece of kombu and add the sea salt. Finally, toss in the portobello mushrooms. Add 3 more cups of water and allow the mixture to return to a boil. 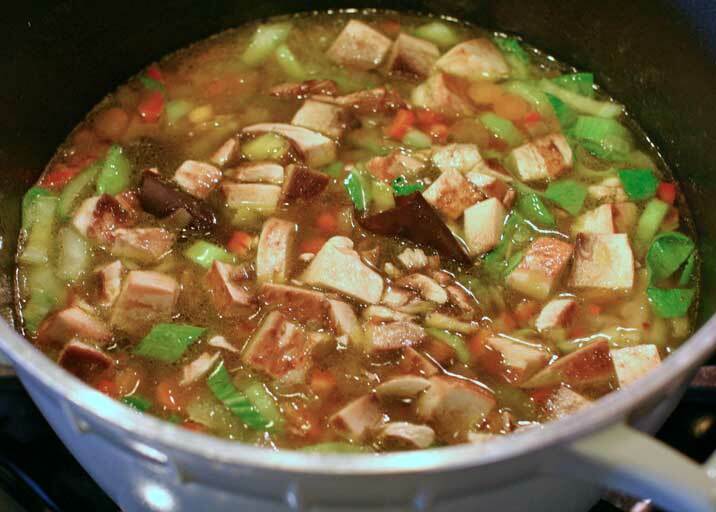 Reduce the heat to low and simmer, stirring occasionally, until all of the veggies are soft. While the veggies are simmering, boil 1 cup of water in a tea kettle or whatever you have handy. In a small bowl, place the dried porcini mushrooms and pour the hot water over top. Allow them to reconstitute in the water for 5 minutes. Strain the soaking water into another bowl, and take the mushrooms out of the strainer with your hands (there may be some debris that the strainer caught, so don’t just pour them out onto your cutting board). 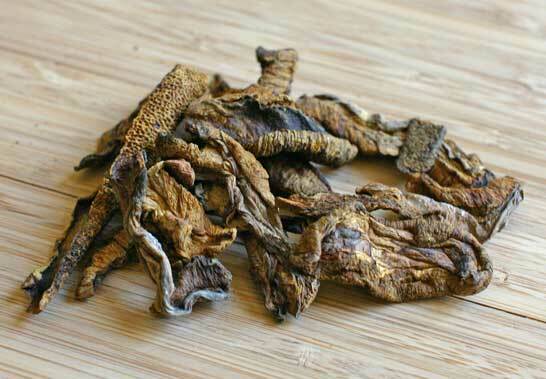 Chop the soaked mushrooms, discarding any hard or leathery bits, and toss them into the pot. Then pour the soaking water into the pot as well. Carefully remove the kombu from the stockpot – don’t burn yourself! 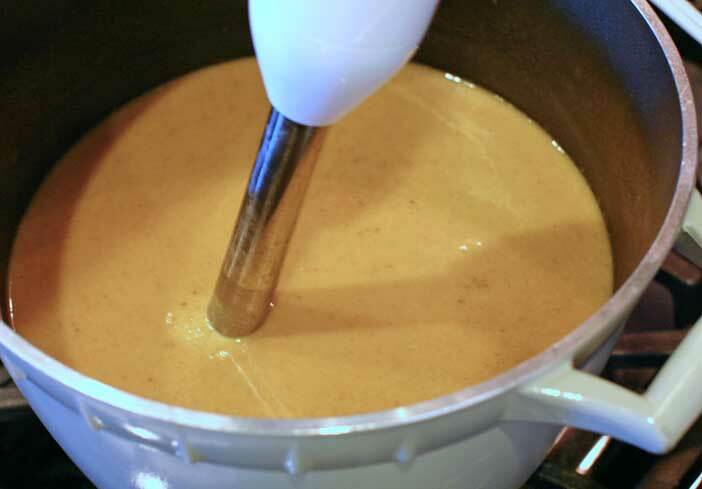 With an immersion blender, purée the ingredients until you have a smooth liquid. You may need to stop the blender and pull out a few straggling chunks of veggies from the casing and blend again. If you do this, be extremely careful that your other hand is nowhere near the power button. If you are accident prone, unplug the blender before clearing the blade. Serve the broth with some whole wheat couscous cooked according to the instructions on the package, or any other grain or seed of your choosing. As garnish, try some bean sprouts or some thin slices of raw celery. You may wish to add just a bit more sea salt to the bowl upon serving as well. Enjoy! Everyone knows that carrots are healthy. Specifically, they are an excellent source of Vitamins A, C and K.
Celery is a good source of Vitamins A, K and folate. The nutrition data on sweet red pepper looks almost like a daily multivitamin, as it is very rich in Vitamins A, C, E, B6 and folate. Bok choy, also known as Chinese cabbage, is also a great source of Vitamins A, C, K, B6 and folate, as well as providing calcium, iron, potassium and manganese. Portobello mushrooms are rich in the vitamins riboflavin, niacin and pantothenic acid and the minerals phosphorus, potassium, copper and selenium, and are thus an excellent supplement to the vitamins and minerals commonly found in fresh vegetables. Porcini mushrooms are a good source of iron and fiber. Kombu provides a lot of iodine. This is a very important nutrient that is difficult to find in natural sources, and so is usually added to refined table salt. If, like me, you prefer to cook with sea salt, however, you may need to find your iodine elsewhere, and this is an excellent source. It also provides iron, calcium, riboflavin, Vitamin B6, magnesium and chromium, among others. 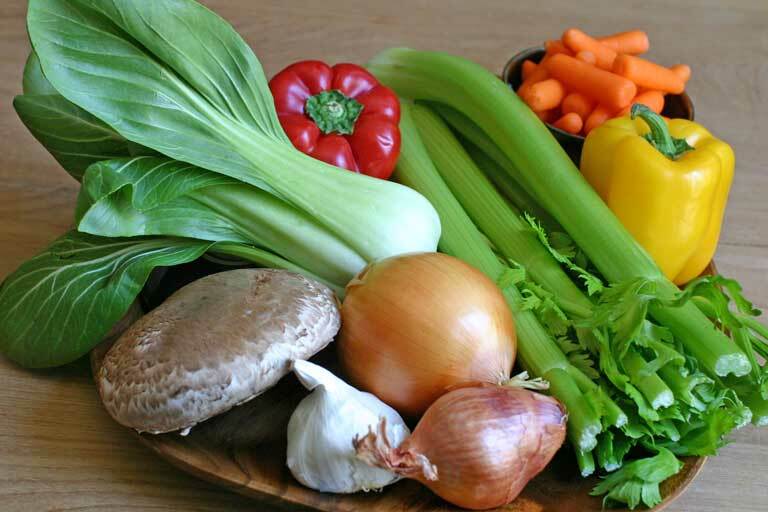 6 Responses to "Inspired Vegetable Broth"
Love the stories behind your recipes! Thanks for sharing. 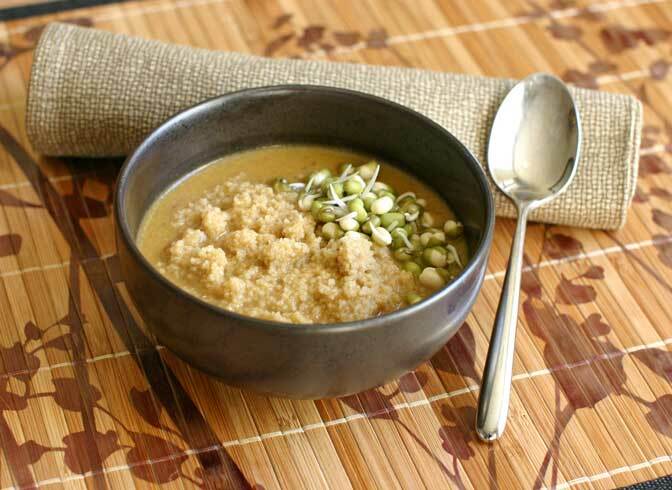 I made this soup many times now plus/minus some ingredients and everyone loves this with Quinoa. Thank you!